Taking Conflict Out of Our Gadgets: Which Companies Are Doing Best? Two years since a U.S. law put the spotlight on the issue of conflict minerals from eastern Democratic Republic of Congo, which American electronics companies are making strides to clean up their supply chains and which are lagging behind—or doing nothing at all? A new report published today by the Enough Project assesses the efforts of the 24 largest consumer electronics companies and ranks them in order. At the top: Intel, HP, Motorola Solutions, and Apple, all of which have taken significant steps to trace and audit their supply chains, as well as support industry-wide certification efforts. At the other end of the spectrum: Canon, Nikon, Sharp, and HTC have made little progress to address conflict minerals in their supply chains, achieving less than 10 percent of the 100 possible points of Enough’s criteria. Notably, Nintendo ranks at the very bottom of the list, having failed to make any known effort to trace or audit its supply chain, despite growing public awareness. This is the second time that Enough has ranked electronics companies according to their progress to address the use of Congo’s conflict minerals in their supply chains. Enough issued its first company rankings in 2010, and today’s report builds on those findings, comparing each company’s current effort to its previous score, when available. Spurred by the increased attention from the conflict minerals provision of the Dodd-Frank financial reform bill and by consumer activism, the 2012 rankings show an overall trend of improvement among electronics companies to invest in a conflict-free mining sector in eastern Congo. However, other industries, including jewelry, automotive, and industrial machinery have made less progress. "Much of the progress that has been made by electronics companies on conflict minerals can be attributed to direct consumer action," said report co-author and Enough Project Student Coordinator Alexandra Hellmuth in a press release. "We are witnessing a mass consumer movement for the creation of a clean minerals sector in Congo. Not surprisingly, college students have emerged as the leading activists on this issue. Students from more than 100 college campuses across the U.S. and U.K. are advocating for their university's purchasing and investment policies to reflect company action on conflict minerals." As part of the rollout of today’s company rankings report, Enough also released a new video featuring actor and ethical mining entrepreneur Jeffrey Wright of “Angels in America,” and “Basquiat,” and the James Bond franchise fame. Wright and Enough Executive Director John C. Bradshaw also co-wrote an oped featured today on the Huffington Post’s homepage to announce the release of the rankings. The report package also includes a new slideshow of photographs from Enough’s researchers in the field. 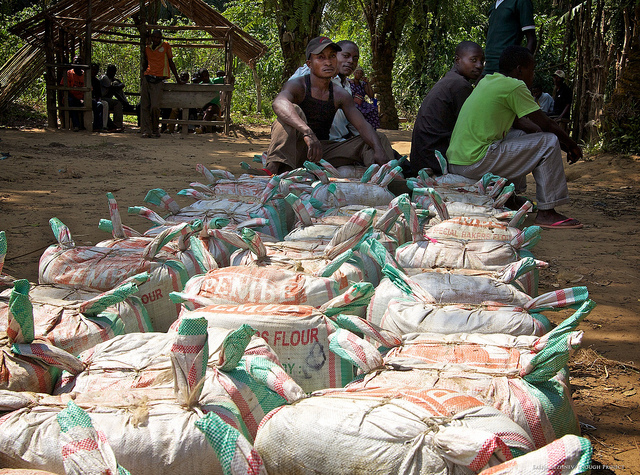 The rankings are designed to help provide consumers with information to make responsible and informed purchasing choices, and to give them the opportunity to demonstrate to companies why conflict-free from Congo is important. The report comes just days before the U.S. Securities and Exchange Commission is expected to vote on the final rules on reporting requirements for U.S. companies potentially dealing in conflict minerals. “The SEC should ensure that retailers and all firms that use the minerals are covered by the rules and that there is not a long phase-in period,” said Sasha Lezhnev, report co-author and Enough Project Senior Policy Analyst. “Otherwise, the Intels and HPs will be left unfairly holding the bag for a problem that belongs to thousands of companies that have been turning a blind eye to this problem for years.” The vote is slated for August 22.